Congratulations to Dustin Hames our latest ‘Extra Mile Award’ Winner! 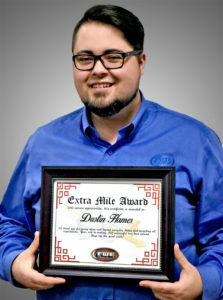 Please join us in congratulating Dustin Hames – our newest recipient of the Extra Mile Award! The NAFEM show is our biggest platform to display our products to a captive audience. It takes months of preparation within several different departments to make everything come together and to ensure we are putting our best foot forward. Dustin played an extremely vital role in the coordination of the show this year. From spec sheet updates and new product display ideas/signage to equipment staging – Dustin had his hands in all of it. He understood the magnitude of this tradeshow and spent several late nights and weekends working to ensure all went smoothly and met critical deadlines. Please join us in thanking Dustin for all of his extra efforts.